As many of you know, we just announced that nine noted scientists, working with the American Kratom Association (AKA), authored a letter to President Trump’s White House Opioid Crisis Team Leader Kellyanne Conway and Acting DEA Administrator Robert W. Patterson. This letter amplified the voice of the scientific community – now it’s time for President Trump and Ms. Conway to hear YOUR voice with this petition. We the undersigned ask for your immediate action to protect the freedom of consumers to make their own health care decisions, and stop the Food and Drug Administration (FDA) from their broad regulatory overreach and the criminalization of millions of Americans who use kratom. Once you sign this petition, please forward this email to friends, family and even neighbors. Even if they are not a kratom consumer, please try to get their help in supporting this petition. It is only because of your continued support that we are able to keep fighting to protect kratom. Thank you for your immediate action today. One user plans to move to Canada. Another plans to quit. Many more don’t know what to do. By Steven Nelson | Staff Writer Sept. 13, 2016, at 6:20 p.m. Hundreds of passionate protesters gathered Tuesday near the White House to demand that the popular plant product kratom remain legal. It was jointly a business industry conference, a tea party and a desperate consumer lobbying effort — but the clear-eyed crowd appears to have little chance of near-term victory. A comprehensive U.S. ban likely will take effect on Sept. 30, just a month after the Drug Enforcement Administration surprised users by saying it would invoke emergency powers to make leaves from the tree grown in Southeast Asia illegal by labeling two main constituents Schedule I substances. In the face of long odds and silence from Capitol Hill, the event called by the American Kratom Association sought to pressure officials to reconsider while laying the groundwork for what may become a protracted re-legalization campaign. A large jug of brewed kratom sat in the middle of Pennsylvania Avenue, with red Solo cups offered to anyone who wanted some. At least one reporter sipped the brew, which tasted like astringent green tea. Another journalist took a pill offered as a free sample by a businessman. Kratom users who attended the rally said it’s wrong for them to lose legal access to what they say is an effective treatment for pain, addiction, depression and other conditions. 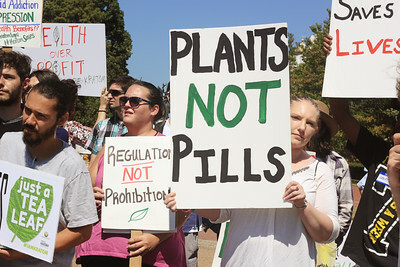 Though many said they were angry, chant-leaders asked the crowd of a couple hundred to stay on message and favored reason over rage, which often is a leading emotion at White House protests staged by marijuana reform advocates who say decades in Schedule I has stalled medical cannabis research amid millions of arrests. “I’m usually very quiet but felt the need to come out and speak,” says Veronika Bamford-Conners, a kratom-selling store owner from Sullivan, Maine, where, she says, most of her customers are older than 55. “If they don’t have insurance and can’t afford medications, they find a cheaper alternative in kratom,” she says, though some seem to prefer relief from the leaf to painkillers, such as a 73-year-old man who she says called her weeping “because pharmaceuticals were killing him” before. Chants at the rally advertised the death toll from accidental overdoses of opioids – more than 28,000 in 2014 alone, including legal painkillers and illegal drugs like heroin – with the low or nonexistent U.S. toll from kratom. The DEA says it believes 15 deaths were caused by kratom, though American Kratom Association founder Susan Ash says the group hired a toxicologist who concluded each case could be attributed to other drugs. Many kratom users say the plant has helped them abstain from substances they formerly were addicted to, often heroin or prescription painkillers. Allen says that although the DEA – and even some former kratom users – say the drug can lead to dependence, it’s nothing like the grasp of opioids. He says he believe it’s about as abusable as coffee, which comes from a related plant, and that like coffee withdrawal, ending kratom can cause minor headaches. Miller says prescribed painkillers from his rheumatologist were too strong and that unlike opioids he hasn’t developed an addiction to kratom. He says he went on a weeklong camping trip and – unlike the experiences of some users – felt no withdrawal symptoms. Though Miller and others at the event said they aren’t sure what they will do at the end of the month, Heather Hawkins says she’s made up her mind to move to Canada, where kratom remains legal. Hawkins, a journalist with northern Florida’s Pensacola News-Journal and owner of the Kratom Literacy Project, says she has an incurable bladder disease and is eyeing Vancouver after already moved to the Sunshine State from Alabama in reaction to a local kratom ban. Talk about moving abroad often is spouted unseriously by political partisans around election time, but Hawkins says she’s completely serious after living in a painkiller-induced haze that left her depressed and unable to get out of bed. “I’m not going to stay here [if the ban takes effect] because I’m not going back to that life,” she says. Hawkins says she’s in addiction recovery from cocaine, which she says she used as self-medication to give her the energy to power through her pain and despair, and that if she regarded kratom as a drug she would not take it. Though kratom is widely known for claims that it can help keep opioid addicts clean, it’s also credited with sapping desire for other substances. Jeremy Haley, owner of Colorado’s Rocky Mountain Kratom, says he began using kratom in 2012 after a drunk driving arrest, and that it has helped veer him away from his alcoholism, which runs in the family. Although the ban hasn’t yet taken effect, Haley says local officials have shut down his shop for what he views as dubious reasons, making him unable to sell the remaining inventory – the latest in what he says has been a constant regulatory headache that featured him asking Yelp reviewers to delete positive reviews to placate federal officials who wanted proof he was not marketing kratom for human consumption. Haley plans to open a totally legal apothecary shop if the ban takes effect. A futuristic drug-detecting fingerprint scanner may soon follow.